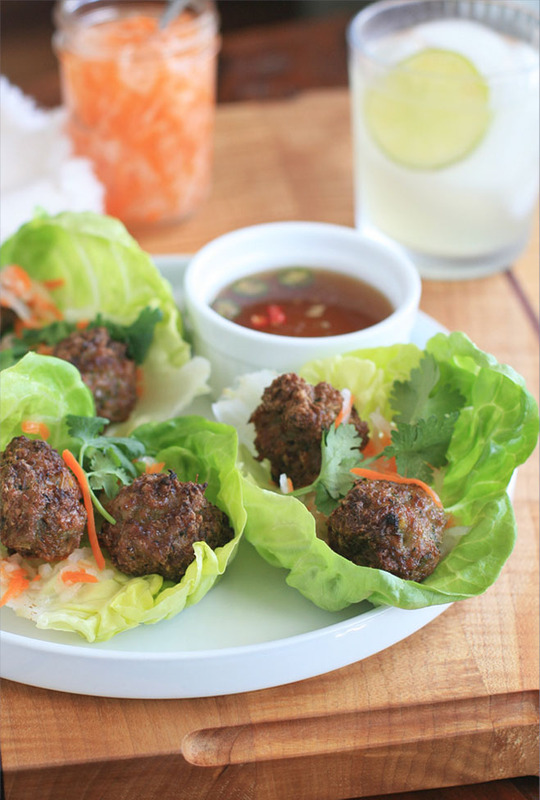 Here’s a fun, quick little recipe using those Vietnamese pork meatballs I posted last week. The traditional recipe includes rice noodles in these little lettuce cups, but I decided to keep things simple… and low carb for those of you who are interested in that sort of thing. 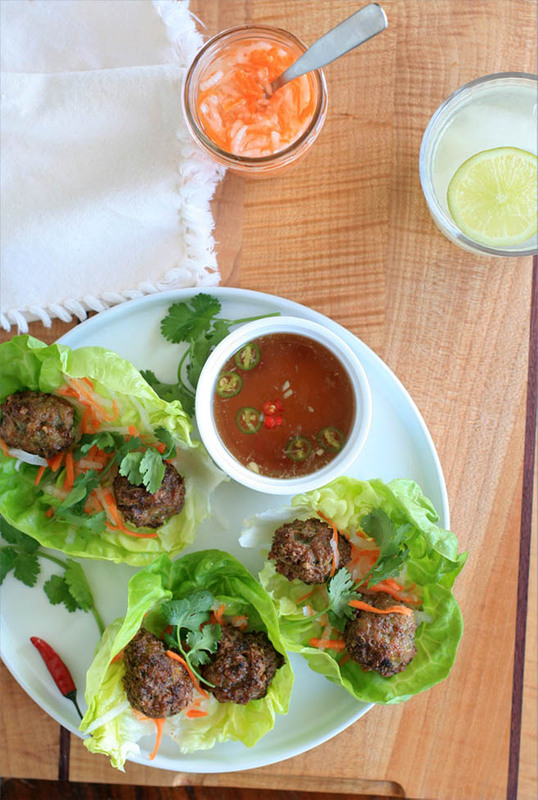 Little lettuce leaves are topped with springy pork meatballs infused with lemongrass and all other sorts of goodness, sweet and sour pickled carrots and daikon, and sprigs of fresh cilantro. Wrap this little number up and plop it into that hot, sour, salty and sweet Vietnamese everyday dipping sauce, nuoc cham. Again, I kept this simple, but feel free to add little piles of cooked rice vermicelli or other fresh herbs like mint, Thai basil or green onion. They pork meatballs are already super flavorful on their own, but adding extra fresh herbs is rarely a bad idea. Place the lettuce cups on a large platter or divided among several large plates. Place two meatballs on each cup, then adds some do chua and a sprig or two of fresh cilantro. 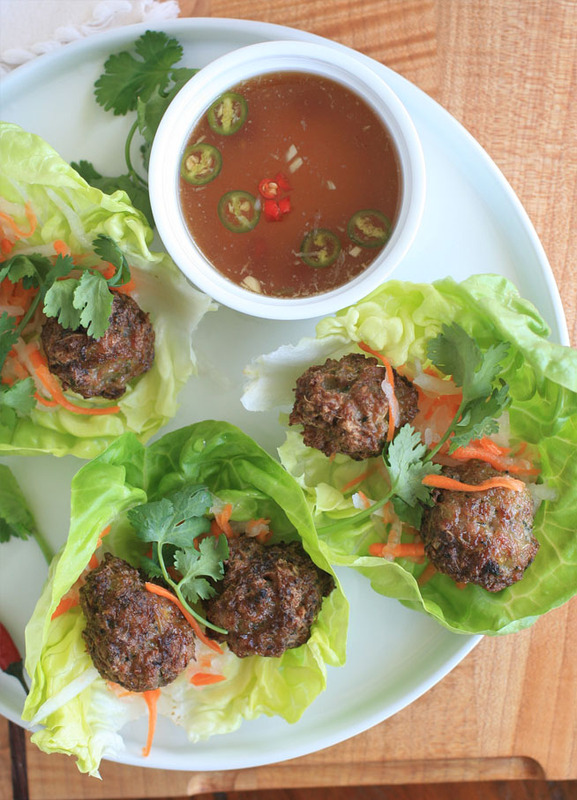 Diners wrap up the lettuce like a little wrap or taco and dip into the nuoc cham.